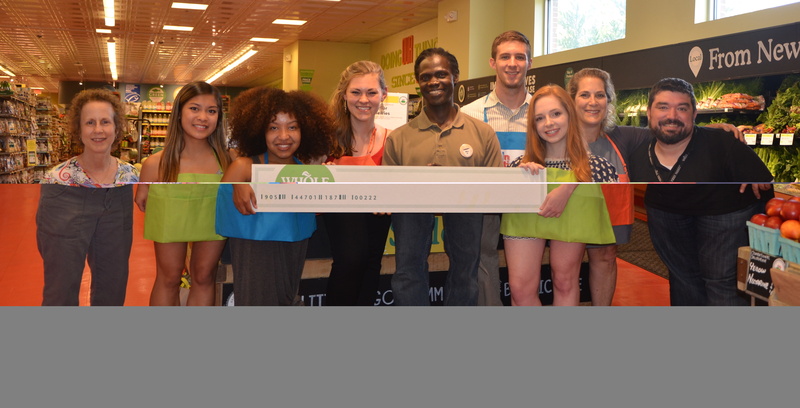 August 05, 2016 12:47 ET | Source: Ingredients for Education, Inc.
IFE/KickinNutrition.TV Team at Whole Foods Somerville Store for 5% Day Check Presentation. (Left to right) WFM Marketing Specialist, Dena Cherenson; IFE Intern, Caroline Morant; IFE Co-Host/Actor, Simone Senibaldi; IFE Program Director, Jamie Klufts; WFM Associate Store Team Leader, Amule Sam; IFE Intern, Harry Nichols; IFE Intern Tatyana Kurepina; IFE President/Founder Natasha Lance Rogoff; WFM Marketing/Community Liaison Manager, Matt Keller. KickinNutrition.TV show star "Stacy" with Producer and customer at Whole Foods Market in Somerville, MA, during 5% Giving Day. KickinNutrition.TV Sizzlin' Food and Fitness Education! CAMBRIDGE, MA--(Marketwired - August 05, 2016) - Four Whole Foods Market locations (WFM) in Somerville and Cambridge, MA, raised $16,125 for Ingredients for Education (IFE) through a 5% Giving Day to support innovative nutrition and wellness education for youth. IFE is a nonprofit organization based in Somerville, MA, that empowers youth and families to lead healthier lives through engaging digital nutrition, cooking, and fitness education, and works to reduce health disparities through evidence-based practices. Whole Foods Markets' generous contribution will support local expansion of IFE's marquee program, KickinNutrition.TV (KNTV), in Cambridge and Somerville, MA. KNTV is an innovative, evidence-based digital nutrition and wellness education program that uses engaging videos featuring relatable storylines, diverse teen characters, cooking demonstrations, original recipes, and interactive gaming to peer-teach youth (ages 6-13) the skills necessary to eat healthier, cook at home, and get moving. Whole Foods Market is committed to supporting "innovative groups that strive to make the world a better place." With a focus on local communities, WFM holds 5% Days four times each year, selecting nonprofit and educational group recipients through an application process to receive 5% of all net sales made that day. IFE's 5% Day was held on June 29, 2016, at the four WFM locations in Somerville and Cambridge, MA. WFM presented the check to IFE on July 13, 2016, at the Somerville Whole Foods Market location. "We are so grateful for the partnership and friendship we have built with our local Whole Foods Markets. Our offices are located in Somerville, MA, and our digital program was piloted in Cambridge, MA, in partnership with local university advisors and evaluators from Boston University, Harvard T.H. Chan School of Public Health, and Tufts Friedman School. We have strong ties to these communities, and by working together with Whole Foods Market, we are better equipped to further our shared missions of positively impacting the communities where we live, work, and play," says Natasha Lance Rogoff, President/Founder of Ingredients for Education. KickinNutrition.TV is uniquely designed for young digital natives and their families. The lessons focus on how to choose affordable nutritious foods and to create lifelong habits that will prevent chronic diseases, such as obesity and diabetes, lead to improved health and wellbeing, and reduce health disparities. Whole Foods Market ® Founded in 1980 in Austin, Texas, Whole Foods Market (wholefoodsmarket.com) is the leading natural and organic food retailer. As America's first national certified organic grocer, Whole Foods Market was named "America's Healthiest Grocery Store" by Health magazine. The company's motto, "Whole Foods, Whole People, Whole Planet"™ captures its mission to ensure customer satisfaction and health, Team Member excellence and happiness, enhanced shareholder value, community support and environmental improvement. Thanks to the company's more than 88,000 team members, Whole Foods Market has been ranked as one of the "100 Best Companies to Work For" in America by FORTUNE magazine for 18 consecutive years. In fiscal year 2014, the company had sales of more than $14 billion and currently has more than 430 stores in the United States, Canada and the United Kingdom. For more company news and information, please visit media.wfm.com. Ingredients for Education (IFE) is a Massachusetts nonprofit organization serving communities, in school and out of school by providing educational outreach using technology and hands-on experiences to foster lifelong healthy habits, leadership, and self-efficacy. Through the distribution of its marquee program, "KickinNutrition.TV" (KNTV) to Title 1 schools and after school programs, IFE provides children and their families with tools, inspiration, and education necessary to take steps to improve health behaviors and lifestyles. KNTV's research-based curriculum and content was developed by a former Sesame Street International Executive Producer, Natasha Lance Rogoff, in collaboration with nutrition and education experts from Boston University, Harvard T.H. Chan School of Public Health, Tufts Friedman School of Nutrition Science and Policy, and advisors from MIT. Its content is evidence-based, tailored for fourth through eighth grade audiences, and works to leverage technology in order to combat health disparities that so often exist in underserved communities. With support from philanthropic foundations, KNTV's program has been adopted by schools, after school programs, and community organizations in New York, Massachusetts, California and Florida, reaching over 25,000 students since 2014. For more information visit: http://www.KickinNutrition.TV or Twitter: @KickinNutrition and Facebook: KickinNutrition.TV.